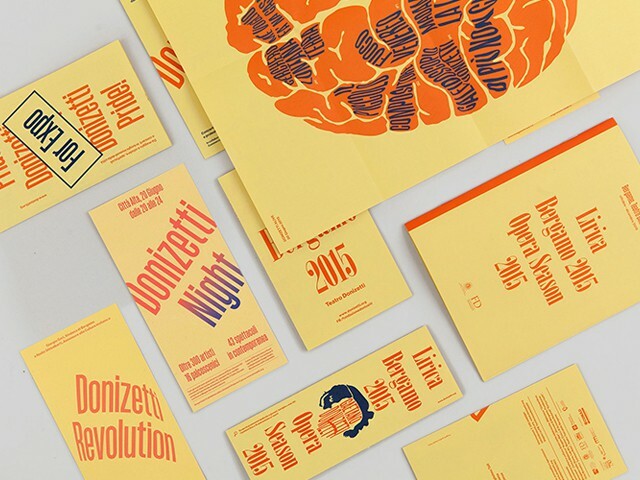 Studio Temp, a design agency located in Italy, has created a striking and unconventional identity for Teatro Donizetti, a theatre based in Bergamo, Italy for their upcoming Lyric Opera Season. The identity uses vibrant colors such as lemon, orange, and navy to create beautiful contrasts that captivate and entrance the viewer. The identity is a much-embraced departure from the classic conventions associated with what may be considered traditional material for this field. The agency created a cohesive campaign, including posters, programs and outdoor advertisements that work together to create a fresh and invigorated take on typical theatre promotions. The use of illustration and type is both unique and eye catching. If Teatro Donizetti was just a little closer to us, they would have a guaranteed attendance from our studio!